Herbs stay fresh longer with this tool that keeps stems immersed in water for hydration. Am I My Herb's Keeper? 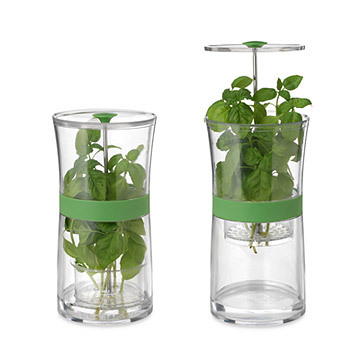 Keep delicious herbs fresher longer with the handy Herb Keeper. Just like fresh-cut flowers, fresh-cut herbs stored with a source of water will retain their flavor and texture for longer than if stored loose in the refrigerator or on the countertop. The suspended slotted tray allows herbs to stand upright and comfortably spaced with their stems immersed in water for hydration. Sleek and slender, the Herb Keeper fits snugly on the shelf of your refrigerator door. Made in China. Perfect gift for the Foodie in your life. Fresh herbs! My Daughter loved this gift! She loves fresh herbs. Perfect for her kitchen. Keeps herbs fresh until she needs them! Looks good on the counter or in the refrigerator. I was disappointed that the product was plastic. I purchased this for my daughter, but will not be giving it to her since it is plastic and I'm sure she wouldn't use it. I didn't see a good description when ordering. I think it is overpriced for what you get and was very disappointed when it arrived. My son-in-law is a gourmet cook and it's more and more difficult to find a great kitchen gadget for him each year for Christmas. The Herb Keeper hit the jackpot! I love this money saver! I use this for cilantro, which comes in rather large bundles. It's great because it holds the entire bunch, and although it is a lot larger than I thought it would be, if it were smaller, it wouldn't hold as much. This takes up almost no space,is very easy to use and clean, and honestly does keep the herbs fresh. My sister in law loves it. Solved a problem in a stylish way. Gray and unusual gift for someone who likes to cook. Great gift for the person who has it all and who cooks with fresh herbs! Bought 2 as gifts for others in family and 1 as 'gift' for myself. Haven't used or unwrapped yet so as to not spoil surprise for others but am looking forward to using it and not having to throw out unused but spoiled fresh herbs. It is much larger than I expected 9.5" tall & 5" diam but can take the place of a 2 liter bottle in fridge.